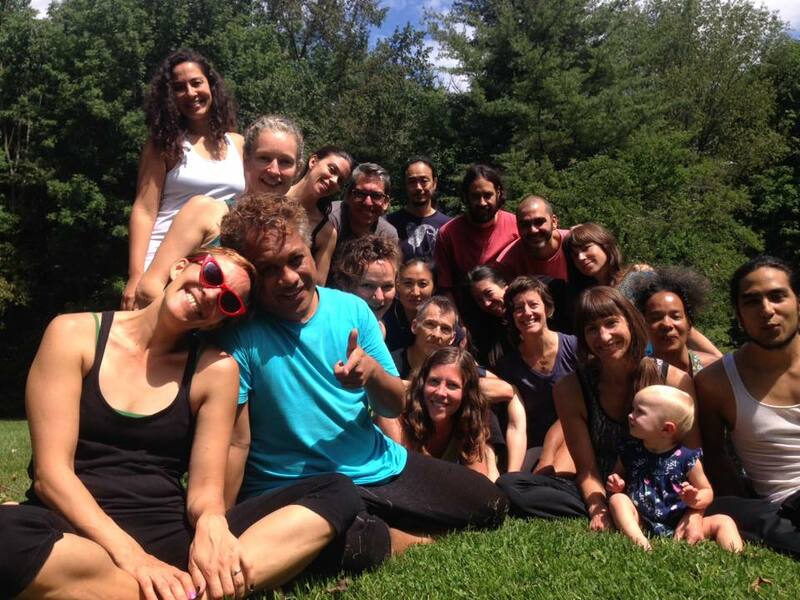 From August 19-23, 2018, 15 artists from Brazil, Burkina Faso, Canada, Germany, Honduras, Mexico and the U.S. gathered at Earthdance in Western Massachusetts for the 7th annual IIAC residency. In addition to our usual track of alumni offering process sharing sessions, five alumni worked on a tandem, collaborative track, focusing on the development of new ideas and material. At the end of the week, all of us offered workshops during the Moving Arts Lab. For more information, and to watch a video highlighting last year's residency, please read below and look to your right! This year's artists included Deborah Black, Cândida Borges, Lacina Coulibaly, Daniel Bear Davis, Krista DeNio, Debra Disbrow, Conrado Falbo, Federico Hewson, Martín Lanz Landázuri, Arely Landeros, Thea Little, Deirdre Morris, Isadora Paz Taboada, and Claire Turner Reid. From July 16-20, 2017​, artists from Brazil, Honduras, Japan, Mexico, the Netherlands and the U.S. convened for the sixth annual IIAC residency at Earthdance. Alumni from former IIAC residencies facilitated process-sharing sessions that encouraged exchange of knowledge and introduced new members to a method. Each new member had the opportunity to offer an embodied response to the process-sharing sessions in the form of an exercise. All participants facilitated workshops during the Moving Arts Lab, engaged in dialogue sessions, and had an opportunity to perform. This year's artists were Esther Baker-Tarpaga, Cândida Borges, Daniel Bear Davis & Deirdre Morris, Krista DeNio, Debra Disbrow, Conrado Falbo, Jonathan Gonzalez, Maré Hieronimus, Martín Lanz Landázuri & Arely Landeros, Jeanine McCain, Odeya Nini, Isadora Paz Taboada, ​Kensaku Shinohara, Tatyana Tenenbaum, Petra Van Noort, and videographer Liz Charky. The four-day residency fed directly into the eighth annual Western Mass Moving Arts Festival (WMMAF) August 17-19, 2012, during which several of the participating residency artists taught and performed. From August 4-8, 2013, fifteen interdisciplinary artists from around the world convened at Earthdance to engage in the first annual IIAC residency. This year’s gathering was initially intended to foster exploration and discussion of collaboration across disciplines and cultures, specifically focusing on creative partnerships between American and European artists. While in the planning stages, it expanded to include other artists working in collaboration, several of whom participated in the 2012 residency and others whom Sciscioli has met and worked with in other international settings. The four-day residency led into the newly renamed Moving Arts Lab (formerly the Western Mass Moving Arts Festival) August 9-11, 2013, during which the residency artists were joined by an additional seventeen professional artists from the local community as well as Boston, San Francisco, Minneapolis, New York and Philadelphia. A round table discussion with the majority of the participants took place on August 12, 2013 at New York Live Arts in New York City. To read more and watch a video of the conversation, click here. (This project was funded, in part, by The Suitcase Fund of New York Live Arts as part of the East/Central Europe Cultural Partnerships Program, with support from the Trust for Mutual Understanding). More in The Dance Enthusiast. From July 13-17, 2014 nine interdisciplinary artists based in the U.S. who are either from or are working regularly in other parts of the world were invited to Earthdance, most for the first time. During the residency, further exchange of knowledge, discussions on process, and feedback were shared. The participating artists were Ellen Fisher (New York); Abigail Levine (New York); Odeya Nini (Los Angeles); Mina Nishimura and Kota Yamazaki (New York/Japan); Peter Sciscioli (New York); Esther Baker-Tarpaga and Olivier Tarpaga (Philadelphia/Burkina Faso); and Larissa Velez-Jackson (New York). The residency fed into the second annual Moving Arts Lab '14, July 17-20, during which each participant facilitated a 2-hour workshop, performed, and engaged in a dialogue session with past residency participants and the community on questions of what is meant when speaking about "interdisciplinary" performance, its role in education, and working with presenters and funders as ambassadors of this work. From July 21-25, 2014 a new branch of IIAC was organized by Dr. Deb Middleton and Dr. Ben Spatz at the University of Huddersfield in West Yorkshire, England. 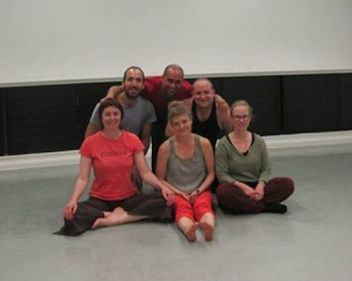 Supported by the Centre for Psychophysical Performance Research, this residency continued IIAC’s approach to practical knowledge exchange through a diverse mix of interdisciplinary work sessions. The six participants were Deb Middleton (Ireland/UK), Ben Spatz (US/UK), Tray Wilson (UK), Daniel Plá (Brazil), Eilon Morris (Israel/Australia/UK), and Karoliina Sandström (Finland/Mexico). Through nine work sessions over the course of four days, the group touched upon the embodied practices of Kripalu yoga, South Indian kalarippayattu, Morris’s rhythm-based “orbits,” the CITLALMINA structure developed by Nicolás Núñez, and the STAR structure developed by Spatz, as well as several other practice structures and guided explorations. The work took place both indoors, in Studio 3 of the University’s Milton Building, and outdoors, at Huddersfield’s newly restored Greenhead Park. During the residency, a practice of reflective and dialogic writing was maintained, introduced by Middleton and utilizing the form of the “explicitation interview” (Maurel 2009). Aspects of the IIAC residency format were woven into IIAC member Iskra Sukarova's and Biljana Tanurovska-Kjulackovski's co-curated festival, LocoMotion, October 27-November 2, 2014 in Skopje, Macedonia. IIAC members Ursula Eagly (New York), Martin Lanz Landazuri (Mexico City), Peter Sciscioli (New York), Iskra Sukarova (Skopje), and Emily Sweeney (San Francisco) were joined by Leonina Korneti Pekevska and Elena Risteska (Skopje) and Kohji Setoh (Kamakura, Japan) for a 5-day residency of dialogues, work sessions and an open showing for the general public called Exchanging, Collaborating and Engaging Urban Landscapes. Eagly and Sweeney also taught a class for students from Saints Cyryl and Methodius University where Sukarova is on faculty. Eagly (with Setoh), Lanz-Landazuri, Sciscioli and Sweeney also presented solo performances and Sukarova presented a duet during the festival. Support for the project was provided by the Trust for Mutual Understanding, administered by Movement Research. 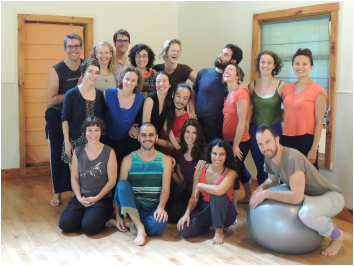 ​From August 16-20, 2015 eighteen artists from Brazil, Colombia, Holland, Israel, Japan, Mexico, and the U.S. convened for the fourth IIAC residency at Earthdance. Alumni from former IIAC residencies facilitated work sessions that encouraged exchange of knowledge and introduced new members to a process. Each new member also offered an embodied response to the work sessions, in the form of an exercise. All participants then facilitated workshops during the Moving Arts Lab, engaged in dialogue sessions, and had an opportunity to perform. This year's artists wer﻿﻿e Michelle Boulé, Krista DeNio, Debra Disbrow, Conrado Falbo, Federico Hewson, LEIMAY (Ximena Garnica & Shige Moriya), Martín Lanz Landázuri & Ursula Eagly, Abigail Levine, Odeya Nini, Peter Sciscioli, Tal Shibi, Emily Sweeney, Tatyana Tenenbaum, Petra van Noort, Larissa Velez-Jackson and Sarah Young. From August 14-18, 2016 artists from Brazil, Colombia, Holland, Japan, Mexico, New Zealand, and the U.S. convened for the fifth annual IIAC residency at Earthdance. Alumni from former IIAC residencies facilitated work sessions that encouraged exchange of knowledge and introduced new members to a process. Each new member had the opportunity to offer an embodied response to the work sessions, in the form of an exercise. All participants facilitated workshops during the Moving Arts Lab, engaged in dialogue sessions, and had an opportunity to perform. This year's artists were Dåkot-ta Alcantara-camacho, Esther Baker-Tarpaga, Margot Bassett Silver, Deborah Black, Will Bond, Cândida Borges, Krista DeNio, Debra Disbrow, Conrado Falbo, Ximena Garnica & Shige Moriya (LEIMAY), Jack Gray, Maré Hieronimus, Marianne M. Kim, Martín Lanz Landázuri , Tara Rynders, Petra van Noort and Edisa Weeks. 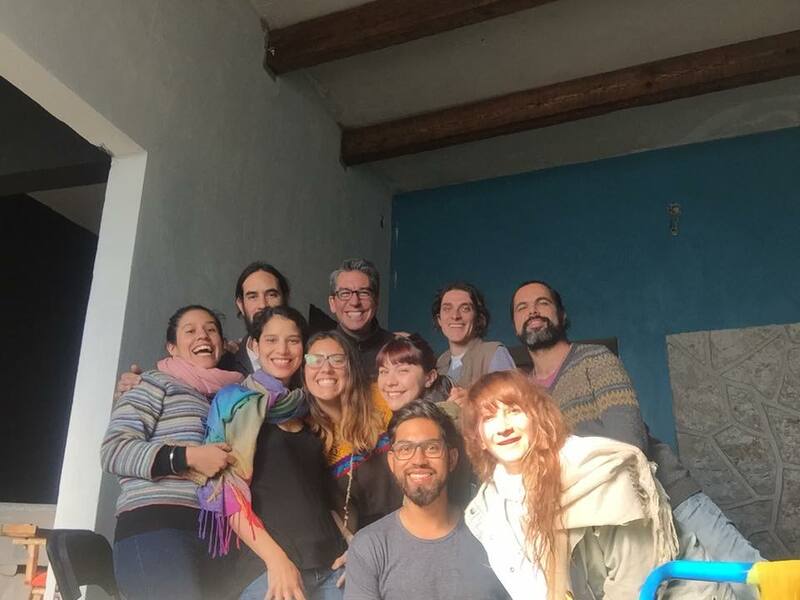 From November 21-25, 2016 IIAC Founder Peter Sciscioli joined fellow IIAC artist Martín Lanz Landázuri for an Encounter de Laboratorio: Condensación with artists from Colectivo de Arte La Vitrina (Chile), Laboratorio Arte Alameda (Mexico), Movement Research (USA), Performatica (Mexico), PLUS Brazil (Brazil/Germany) and Centro Cultural Segundo Piso (Mexico).